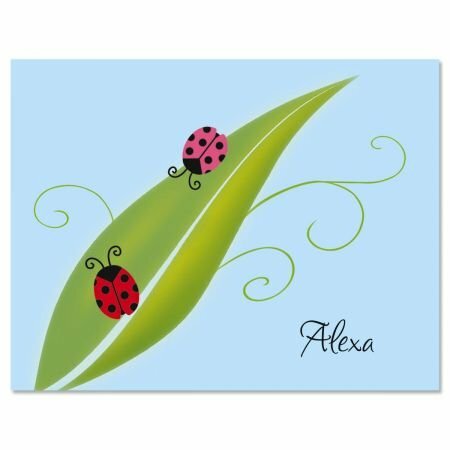 Cool blue and green design has 2 spots of bright red and pink in the form of 2 little ladybugs. These personalized 4 1/4" x 5 1/2" note cards are sure to bring smiles to recipients! Great for thank-yous, invitations, announcements, and just catching up with old friends. Set of 12; white envelopes included. Specify 1 line, up to 18 characters. Our cards are 4 1/4" x 5 1/2", quality stock. Use the "Customize Now" button to add text; Specify 1 line, up to 18 characters. If you have any questions about this product by Colorful Images, contact us by completing and submitting the form below. If you are looking for a specif part number, please include it with your message.